Gorge Rentals Property Management is your complete home rental service in the Columbia River Gorge. As a full service Columbia Gorge property management company, Gorge Rentals specializes in vacation, monthly, and long term rental homes and properties in the Columbia River Gorge. Gorge Rentals has a wide variety of homes to rent, from as few as two days to a monthly or long term lease. We offer cottages in downtown Hood River, Oregon, views homes on the bluff in White Salmon, Washington or secluded country homes with fantastic Mt. Hood views. Whether looking for a home to rent or for a dependable company to manage your vacation home or long term rental home, Gorge Rentals offers highly professional, detailed and friendly service to both owners and tenants. We take pride in offering clean, well-maintained, quality rentals. Gorge Rentals is a year round vacation rental home management office in the Columbia River Gorge. Gorge Rentals maintains an inventory of nightly, weekly and monthly vacation homes throughout the year. Servicing Oregon and Washington, we have a home to fit your lifestyle in our selection of Columbia Gorge real estate. Color photos, detailed information and a calendar showing available dates accompany each of our Columbia Gorge properties. For Hood River vacation homes and other vacation rentals in the Gorge, select one of our featured homes. Directions to each home are provided. Hood River vacation homes are a popular choice for summer visitors. 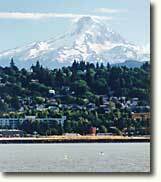 Many of our Hood River vacation rentals are located within walking distance to downtown Hood River. Other vacation homes in White Salmon, Washington and in the Hood River Valley are close to hiking, mountain biking and snow skiing. Enjoy a day of white water rafting in the summer or snow skiing at Mt. Hood Meadows in the winter. Come visit the Columbia Gorge for a romantic getaway. Always travel with a favorite pet? Some owners allow a well-behaved, trained dog, cat or other pet for an additional fee. The staff of Gorge Rentals is here to help you have a wonderful vacation in the Gorge so ask us if you have a special request. The Pacific Northwest is an incredible place to spend a day or a month. Gorge Rentals offers property management options. Gorge Rentals believes that service is the most important element of property management. We provide different management options to meet each property owner’s specific needs in maintaining a rental investment, whether a vacation home or a long term rental.